At first the others didn’t trust Ilahi because he’d never killed anyone. But he could find things. This had been his job with their unit, finding the enemy, finding supplies, finding… anything. Away from the war, he became essential, and by the time they reached the salt marshes, Tran had begun to make excuses for him to the others whenever he did anything too outlandish. Mishy never made excuses for anyone, and she waved away Tran’s excuses whenever they came up. Mishy felt that excuses were beside the point. They were short on rations and short on ammunition, and none of their dreams were giving them any direction that indicated anything useful about finding their way back to the unit or even any allied unit any time soon. It was not time for excuses. It was time for results, and Ilahi had them. Edward spotted it first: the blistering white house in the salt marshes, with its full complement of blue bottle trees and tiny blue flowers around its hedges. When they got closer they could see that the windowsills were lined with blown glass pufferfish, amber and blue and clear. No one found it strange that there were no lights on, as it was broad daylight when they got there, but when they knocked and tried the open door, it turned out that no one was inside. Ilahi carefully took his shoes off anyway. “What are you doing?” said Mishy. “No host, no guests,” said Tran. None of them wanted to count how many months it had been since they had been in a proper house—still more for one that had not been commandeered and turned into the headquarters of one thing or another. This was a house that was still a house. Mishy wondered aloud whether the pufferfish were guards. They waited on the first floor for the owner of the house to come home, perching on the kitchen chairs like long-winged sea birds. Tran went around the grounds to the boathouse and back again. When the colors of the sky warned of impending sunset and still there was no owner, Edward unpacked biscuits from his backpack, and Mishegoss prowled the kitchen. “I have,” said Edward around a mouthful of biscuit. The other two watched to see if he would join in. His hand moved almost faster than they could see, even when they were watching, and he was the first one to light candles in the front room, making the light dance weirdly off the pufferfish, the first one up the stairs to give the second floor a more detailed look than they had given it when they were just assuring themselves of the owner’s absence. They slept under the guest bed, on the planked floor, except Mishegoss, who sprawled across it, at first with defiance and then with the boneless snores of a child. Edward and Ilahi were awakened in the night with hooting cries outside. They crouched at ready, catching each other’s eyes, but it was only sea birds or the wind, they came to think, for nothing came of it. Mishy and Tran slept on unhindered. Eventually Edward fell back to sleep, and then Ilahi. “No one is following us,” said Ilahi, and the rest of them looked away, uncomfortable, not asking how he knew. They had long since stopped the normal, healthy practice of pooling their dreams every morning, only mentioning them if someone had a dream that had something useful to say about the next day’s directions. “None of this land is fields,” said Tran. The uncomfortable silence fell again. “Men are not like fish,” said Ilahi from his place at the stove. He had not found any dried fish in the pantry, but there was no good way to explain about this to the others, and he supposed there might be some fisher-folk who ate or traded all their catch fresh all year round. He couldn’t conceive of it really, but he could make a picture in his mind where it was true, and it was more comforting than a picture with no road, no fields, no fishers, no forge, no tools, and what then? Better that Mishy not get her heart set on humble fisher-folk. Better that she not get her heart set on humble anything. “Guts are guts,” said Mishy cheerfully. Ilahi sighed. Her heart set itself without his interference. It always had. Seeing nothing better to do, they all went down to the shore after they had their oats. The slope was sudden, held in place with sea-grass, but there was a path for them to scramble down, a way that people went often, with the grass paved over with boards leading down to a dock. “So what?” said Tran, her voice loud noise on its own. “Less than their dreams,” said Ilahi, but no one paid him any attention. When they had a good look at the dock, it was not what they expected, not the rickety wood structure that went out a bit to let little boats moor at will. It would do that, if they had had a little boat. Ilahi immediately yearned for one. But no. When they were standing on the edge of the water-darkened wood, peering out, the dock was thick and sturdy, with stairs going down under the water and a very specifically shaped hole. “Like a lock for a key,” said Mishy thoughtfully. While they were speaking, Ilahi was taking off his boots and uniform jacket and trousers. In just his skivvies, he slipped into the water, holding fast to the dock. “Oh,” said Tran. Mishy was already halfway out of her uniform. Edward felt it was his duty to scowl and protest—felt that someone should stay on land, to explain themselves to the owner of the house—but the sea was there, warm and clear by the dock and the deep green of fused radioactive glass further out. He thought of the battlefields he had fused like that, with the tools he had left behind, and bent to take off his boots. “I dove as a child. Yes. I’ll dive.” Ilahi swam around underwater, blinking against the sting of salt and then finding it natural, remembering it of old. There were mooring clamps under the water, against the dock, and they had not had time to rust or grow barnacles. He surfaced and reported this. “They’re still using it,” said Tran. “They might come use it now,” said Edward, still sitting on the dock in his skivvies. Edward splashed sheepishly into the water, leaving his sparsely loaded gun on the dock where it ought not to be. There were tiny blue fish, and the underside of the dock echoed when they huddled underneath it to rest. Ilahi dove under again and found a tiny notch. It clicked back and forth under his curious fingers. Back, and then forth again. It pulsed. He surfaced. He said nothing to the others of what he had found. They didn’t feel the vibration of the undersea vessel coming towards them through the water until they were dried out and sleepy in the kitchen that night, eating the last of the cheese and drinking slightly stale-tasting water from the kitchen tap. “They’re coming back,” said Tran, going very still. Edward moved to shut off the lights of the kitchen before anyone could see, but Ilahi stopped him. Mishy slipped out the door through the dark to watch. Blue light bubbled up through the water by the dock. And then there was stillness and silence. Mishy came back in. Until that moment no one had to be in charge to tell her. No one knew who would be if someone had to. There was an awkward silence. While they were all realizing what the awkward silence meant, the splashing started, a regular churning splashing that sounded like nothing they had heard before. Mishy slipped back out into the darkness. The rest of them stood frozen in the kitchen, trying to tell from the strange noises what was going on. “That makes sense,” said Ilahi. There was a distinct thawing of the air then, as they all remembered that, despite taking watches, they had not gone back to their unit, no one was in charge of anyone, and they still had to agree on things. They could still act like people who agreed on things. “But we’re still sleeping in the house?” said Tran. “Maybe in your region,” muttered Tran, but they scattered the flowers behind them like wedding attendants as they went up the stairs to bed. They managed to get to sleep under the bed, knowing that Edward was watching, knowing that he was the vigilant one. Mishy joined the others this time, resting but not able to drop into the comfort of the night before. It was Ilahi’s watch before anyone heard anything further. He was sitting against the closed door, looking back and forth down the hall, when he heard footsteps in the kitchen below. Just one set, and nothing so comforting as voices. The feet padded, like their own feet. Ilahi took in a quiet breath through his nose: the person below had taken off their shoes. He ached to believe that this made them a guest or a host and not merely aiming for stealth. But he knew what he wanted to be, and he knew what he was, and he knew the sleeping forms in the room the same. The figure that ascended the stairs, sounding almost like another wind through the sea grass, was almost like Ilahi himself. Almost. It was paler and greener, and in the dim light of the hall he could not tell whether it was male or female. The stranger’s limbs bent and waved like the sea grass his ear had yearned to mistake it for. There were more joints than Ilahi expected, and there were—he was the finder, he knew to look for them—webs between the fingers, shadows along the neck that might be gill slits, might be anything. “Is this your house?” said Ilahi. “We can—we can pay you for the—if you take money, if they were your cheeses—” He stopped. It did not look like the sort of stranger who made cheeses. Was he making too many assumptions? Ilahi had only known one kind of quiet offered to him by strangers. He couldn’t imagine that it would be better from those who bent in strange ways. He whimpered and instinctively lashed his hand out to say no. The stranger put up a whippy bent hand to stop him, and then his foot was going, too, and it was all instinct, all army training, and the stranger bent and squelched and crunched in sickening places. Then the stranger went down. Ilahi bent to the whistling noise coming out of the stranger’s nose. Then nothing. He made an involuntary high strangled noise himself. There were more footsteps below, and this time voices, a chorus of horns. The footsteps on the stairs were more like footsteps this time. “They’ve come,” said Ilahi. The others stood looking at him. Ilahi, staring down at the body, said nothing. It didn’t bend the way he expected even for a dead body. The ones on the battlefield had all bent oddly, but all in the manner of death. This, though. This was a modified person, a person who had been modified long before he arrived to kill it. “What did it do to you?” said Edward. “And then,” said the nearest one, prompting. “He will not,” said the nearest one. “We’re deserters,” said Ilahi steadily. Tran made a scornful noise. “We do not have masters,” said the most talkative of the strangers. “We come and go in the paths of the sea as we will. You may accompany us if you will, but the one among you who has done this thing—” The gesture that he made at his fallen comrade ripped and waved, and Mishy leaned forward to watch it, surreptitiously trying to copy behind her back with the hand that did not have her gun held down by her side. “Mish,” snapped Edward in a harsh whisper. “I didn’t mean to,” said Ilahi. “You can of course explain this, if you join us,” said the middle stranger. “Here we have no jurisdiction. You had no jurisdiction either. That did not stop you.” The most outgoing stranger turned and made a harsh bubbling noise in its throat. Edward stared. They turned and shuffled down the stairs. Ilahi pushed the others back into the guest room and followed them in, shutting the door. “What do we do?” said Mishy. “We weren’t important enough for that,” said Edward distractedly, trying to convince himself. “You could be their master, you mean,” said Tran. “We’d protect you. And anyway you can apparently protect yourself,” said Mishy. “You’d never thought it, had you,” said Ilahi bitterly. When Ilahi woke, he was ready to share his dreams again for the first time, like a normal person. He had found in them a road leading south along the sea coast. But his friends had left the guest room. Someone had cleared the stranger’s body from the hall. Tran was alone in the kitchen. All of the guns and knives except Ilahi’s own were in a neat pile on the table. “Where are—” he started. She jerked her head at the kitchen window. He peered out it. Edward and Mishegoss were climbing from the dock to the top of the bubble. It closed behind them. Then the churning, splashing noise began again. This time, as it was full daylight, they could easily see from the kitchen window that the water was making a great froth, suds on the deep green. When it cleared, the bubble was gone. Ilahi and Tran sat down and stared at each other across the kitchen table. “I don’t think they’re coming back,” said Tran. 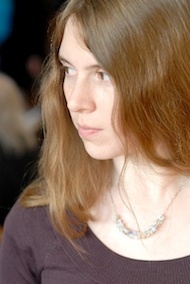 Marissa Lingen is an American science fiction and fantasy writer born July 26, 1978 in Libertyville, Illinois. Trained in physics and mathematics, she worked for a time at Lawrence Livermore National Laboratory. Over the last decade her short fiction has appeared in Analog, Ideomancer, Baen’s Universe, Clarkesworld, Futurismic, and Nature, among other venues, and stories by her have been reprinted in several anthologies including David Hartwell and Kathryn Cramer’s Year’s Best SF 15. She lives in Minnesota.